You’ll find yourself in a lovely little village where there are an abundance of studs to collect. Make your way around the map picking up the studs as you go. Make for the village of Bree and meet Gandalf at the Inn of the prancing pony by heading towards the blue arrow at the bottom of the map and you’ll see a dog on your RHS. Now you need to go around the map and find the items that people want (these are indicated by the image above their heads). At the bottom of the village in the centre of the map there are two people holding a banner which they drop, this causes a pile of wood to appear on the floor. Use the A button to pick up the wood and use the A button again place it on the BBQ to the LHS (big silver shiny thing). Switch your character to Sam as he has the ability to set LEGO bricks on fire, and stand in the gold ring by the BBQ. Use the A button to light a the fire which will make the teapot heat up and give you a cup. Take the cup to the character with the cup above his head (the grey arrow will guild you to him) and use the A button to give it to him. At this point I noticed that Sam was also holding the joint of meat which is what the dog wanted, so I’m not sure at what point I got this. Use the A button to give the meat to the dog. When the dog has finished eating the meat he will move to clear a path, go through the gap and down the path. Head down the path and you’ll bump into Mary and Pippin. Make your way around the maze and find the mushrooms that Mary and Pippin has asked for but watch of for Farmer Margrott. Tip: the mushroom is in the centre of the maze, use the A button to pick it up and run as fast as you can back to Mary and Pippin. Make your way through the gap where Mary and Pippin were sitting and head to the back of the area to complete the level. 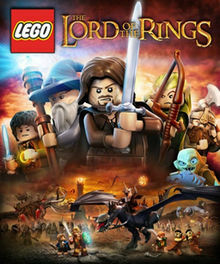 This entry was posted in DS and 3DS, Games, LEGO Lord of the Rings on February 16, 2013 by Tasha.